There is going to be an tournament for U12 and U15 players at Welwyn on Sunday 27th April - and any U12s and U15s from across the county can take part (that is school years 5-10!). U15s: With the top regional U15s away training the tournament is being organised specifically to give club U15 girls - who can normally miss-out on games at this time of year - a chance to play. A Hertfordshire team will be formed from any girls attending, and will play against similar combinations representing Eastern Counties, Kent, and Middlesex. This is a great opportunity for any U15s, but most especially those who may not have played county rugby before and might like to get a taste for rugby at the next level. This will be the second time that a weekend like this has been arranged after a very successful afternoon in February, and based on that event I am certain that ANY of our U15s would be more than capable of holding their own - and really benefiting - from taking part. If you are interested please contact the U15 county manager - Peter McCullough - at peter.mccullough@ntlworld.com. Teams will meet at 12.15 for a 1.00 kick-off. U12s: On the same afternoon there will also be a U12 match between Hertfordshire and Eastern Counties. If you are interested in playing in this please let John Birch know asap. There will also be a U12 event at the Dorking Sevens on 11th May... though in that case it clashes with Herts Sevens. However, HYG is a U11 event so there may be enough girls left from Year 7s to form a team - and as our U18s are going pooled transport should be possible. So if you can play in this please let John know. Congratulations to Worcester and Welwyn/Basford on winning their second round ties in the National Cup last Sunday. Unfortunately for us, that means that our match against Basford on 13th April will have to be cancelled as they are contesting the National Cup final on that day. Should be a great competition! Though not an official team, an England U18 "development team" took on the Canada U19s yesterday. As a team name it smacks of a certain pedentry as it would have been made up of this year's TDG girls - the cream of the age group - but RFUW field no official sides below U20 level so "development team" it was. The game was played at Heythrop Park in Oxfordshire, where the TDG group train, and it sounds like it was a terrific match (though the weather was far from perfect!). Canada had thumped an "official" Scotland U18 team 53-0 earlier in the week and quickly built up a 14-0 lead. But "England" fought back with two tries - both unconverted - and it would be problems with the boot that would be their downfall. Always on the Candians' heels England eventually lost out out 19-15 - three tries each, but two conversions to nil. Canadian age group teams seem to be touring Europe and North America every holiday now - there seems to be a huge long-term effort to build a strong national team over there (and, one must conclude, a fair bit of money as well). Canada are probably well ahead of the USA now (despite losing the Hong Kong Sevens to their North American rivals last weekend), and probably France too. It is likely that the girls who played at Heythrop this week will be seeing quite a bit of each other in the future! Please note that, due to pitch availability problems at Ampthill, we have moved Sundays U18 and U15 7s games to the Letchworth ground. Can players please meet at the Letchworth club by 1.45pm for a 2.30pm kick-off. Why not could come along at 1.00pm to support the Colts in their Cup quarter-final against Fullerians? Following your lazy, rugby-free Easter Sunday, we need a full turnout for Thursday training ahead of our visit to Ampthill for 7s matches this Sunday (March 30th). Training will start at 6.00 pm this Thursday. I'm not entirely sure what the above headline means, but I am guessing that it is not a million miles from "certifiable lunatics play rugby on frozen Finnish lake...". Its March, your north of the Arctic circle, its more sub-zero than anyone with any sanity might wish to become acquainted, so what do you do? 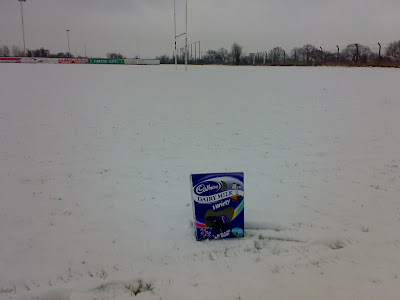 Stay warm and snug by the fire... or play rugby? Faced with that choice earlier this month Jyväskylä Rugby Club, about 200 miles north of Helsinki (or anywhere else, come to that) decided to run a rugby tournament. Lumirugbya is what they called it - Snow Rugby apparently - and some real Lumis from as far away as Luxembourg leapt onto whatever the appropriate transport was in order to get there. Exactly what then happened is best left to this in-depth report and your own abilities at reading Finnish - though an Italian enthusiast I know with a smattering of the language tells me that the home team came out as winners, beating Helsinki Warriors in the final. After a slow start, I hear that the number of entries for this year's Herts Sevens is picking up - but then it was a last minute rush the past two years as well. So far in the U18s we are joined by Reading, Hertford and Basford, while the U15s feature Welwyn, Reading, London Irish, Rochford, and Hertford. So there is still plenty of room for extra teams in what has been a great event for the past two years. Herts Sevens is a great place for teams preparing for National Sevens - but is also a competition that any team can enter, especially new clubs who my find the idea of the Nationals a bit daunting. So come on not only Worcester and Kettering but also Swaffham, Ampthill, and the East Anglian clusters - this is YOUR day... you only need eight or nine girls (and teams have even got by with seven in the past!) - contact Laura at tabardminis@hotmail.co.uk for details. One probem is that at U18 level I understand that South East league fixtures may be keeping some teams - like Welwyn and leading London/Surrey/Kent teams - away which hopefully is not a sign of things to come (though with the expansion of the county and regional programme next year at the expense of club and league dates I suspect it could be). The RFU are calling for players, parents, and supporters to let them know their views on rugby and what the game means to them. In the last ten years the game has undergone a great deal of change with the success of England’s national teams and recruitment campaigns, and the RFU is now conducting an online survey to widen the debate - see http://www.rfusurvey.co.uk/. Has to be said that most of the first five questions are a bit ... theoretical ... and not wildly relevent to the challenges of the female game, but sixth question is wonderful open-ended invitation from the RFU that might be used to tell them exactly how you think that some traditional "values" of the game "assist" with the development of girls' or women's rugby. Enjoy. Further details will be sent out during April, but the costs are low - and anyway chances are we'll happily pay for any parents or players interested in attending. So if you are interested in going please let me or Mike know asap, or for more info about the day contact Gemma Ryan at the RFUW on 020 8831 6788 or at gemmaryan@rfu.com. The RFUW has announced the creation of a £7,500 of "Club Development Toolkit Fund" for clubs begining of developing girls or women's sections. Clubs are asked to apply directly through a bidding process to receive funding. It is a one-off opportunity, so the messahe is to grab it while you can! Marketing and advertising the club in the local community. Letchworth Garden City Hertitage Foundation's latest report (issued to all homes in the Garden City this weekend) includes mention of new grants from the Foundation to support "sporting excellence". For many years the Foundation has supported the provision of facilities and equipment in the town - we have benefited outselves, with the Foundation contributing to our initial equipment costs back in 2004, as well as being lead sponsors for both the Herts Sevens in 2006 and Canada Day last season. Now they are offering up to 100% grants to support coaches gaining advanced qualifications (Level 2 and above), as well as 50% grants towards the coaching costs of talented atheletes, and up to £1,000 in equipment costs. Anyone who lives in Letchworth OR who participates in sport in the town is eligible - see the LGCHF site for details. Is this the best online guide to playing rugby ever? 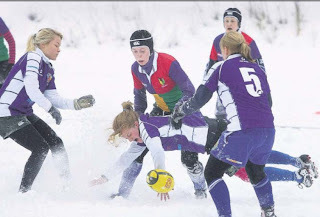 A couple of US students - Lyci Hillman and Catherine Foo - have produced a staggeringly brilliant guide to playing rugby - and moreover a guide for specifically girls and women playing rugby - that for simplicity and clarity knocks anything else dead. The actual writing is a bit ho-hum, but the combination of photographs and computer-generated images used to cover pretty much all the basics - from what to wear to how to tackle, form a scrum, and basic tactics - is amazing. Its astonishing - to the extent that you wonder why its not been done before. I know there some good illustrations in various official coaching guides, but these are invariably a) buried away inside expensive printed resources, and b) tend to feature exclusively large, muscular and - above all - male athletes. This guide uses - in its photos and excellent computer-generated diagrams - exclusively female figures, something that I cannot recall seeing anywhere else before. But it doesn't end there. Whereas the illustrations in official guides are invariably surrounded with all sorts of copyright restrictions, the two authors - who have now gone on to bigger and (persumably) better things - have also allowed anyone to use their images for non-commercial purposes. So if anyone ever needs an illustration to cover a specific coaching point then this would seem to be the perfect place to start. In all honesty I am not wildly sure how much interest you all have in the wilder world of girls' and women's rugby, but assuming that I am not alone in being in a household where the next two weeks stretch ahead into the far distance, and where there are indeed limits to how much revision you can do and chocolate you can eat, I thought I'd pass details of a few mildly diverting websites on. Of course the fact that the author of Ruckosphere describes our blog as "one of my all-time faves" has no influence whatsoever in my highlighting it because its a great starting place as the site reviews the leading girls' and women's blogs, worldwide. The author (and site) is actually based in Bremen in Germany, but the site is almost entirely in English. The author is also a leading contributor to probably the best news and discussion forum for women's rugby. 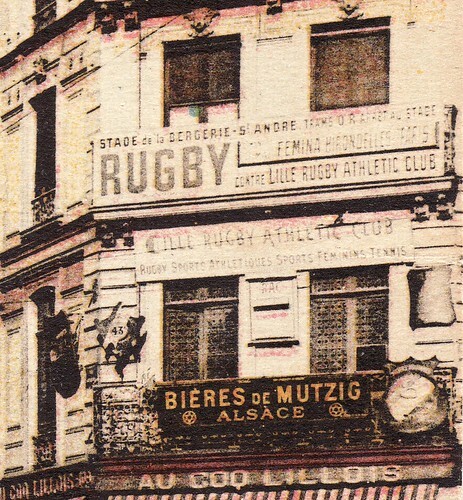 Run by FIRA - the Paris-based Federation of European Rugby Associations - it is very effectively moderated, a lack of which was the downfall of a similar service run by the IRB. Anyway all this goes to show that, despite the lack of media coverage, this is a significant international sport that you are playing. 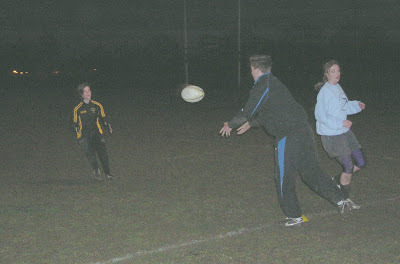 While Simon took a break from rugby for a long weekend in Prague, Wonky kindly stepped in to take the regular Thursday training session for the girls. So on a cold and windy evening under the Letchworth floodlights, I wandered down to capture the event on camera. Just in case anyone doubted the worldwide readership for this site, take glance at the bottom of the right-hand column. This shows the last ten or so people to log on (and where thay are from, and what they were reading) as well as a map showing the last fifty or so "hits". At the time of writing most of northern Europe is bright red, as is central and eastern USA, with additional interest from places as far apart as Turkey, New Zealand, India and Argentina! With snow now forecast for Sunday it couldn't be a better time to have weekend off. And it may even soften the ground up a bit for the usual hectic final few weeks so that the sevens don't take place on concrete this year! Meanwhile apparently the main Letchworth rugby website have now set up a "feed" so that anything on here automatically now appears there as well. At the minute I am not entirely sure how we can reciprocate as there is isn't an obvious feed from there for this site to tap into, so all I can suggest is that is you want to keep in touch with anything the wider club is doing or planning then remember to drop by http://www.letchworthrugby.com/ every now and again. Although matches seemed to be being cancelled all over the East due to water-logged pitches, Laura and Josephine braved the awful weather to play for Ampthill at Hertford in a three-way U15s meeting which also involved Old Albanians. 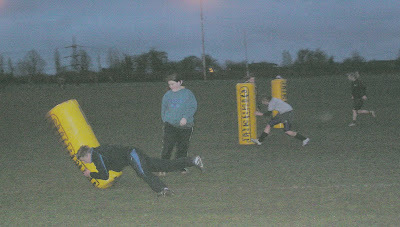 As it turned out the pitches were in very good condition (at least, considering the amount of rain we'd had!) but the wind was of the strong, rapier-like style that chills everyone to the core in just a few minutes. So conditions were not too good, but the rugby was excellent! Three matches were played so each side played against the other two. Ampthill's first game was against the home side and both Letchworth girls were soon heavily involved. Unfortunately, after a strong run through the Hertford defence, Josephine suffered a twisted knee and, though she tried to carry on, it ultimately meant that she had to leave the field and could take no further part in proceedings. Ultimately, Hertford proved too strong for the visitors, running out worthy winners by 25-0, though it was a much closer contest than that scoreline suggests. - and went from strength to strength during the game. In the second half Laura was denied a try only by a fine last-ditch tackle that saw her bundled into touch at the corner. The match was finely balanced and well-contested throughout so that even when Ampthill started to open up a lead in the second half OAs staged a spirited comeback and almost snatched a draw : Ampthill eventually winning by 20-15. All in all a fine afternoon's rugby despite the rough weather! Needless to say this is the Women's Six Nations, rather than the other one. In practice England did seem to make hard going of it - beating Ireland only 17-7 (comfortably their closest result since the World Cup) to win the title, and moreover they managed to conceed three tries this season (compared to one in 2007). Still, three Grand Slams in succession is a first (since the championship expanded anyway) though I am not holding my breath about the average rugby journalist noticing. Ireland finished 4th, by the way, with France 3rd and Wales 2nd. More info here. We are still hoping to enter a joint U15 team with Ampthill (and could even still enter a combined U18 team as well) - but that is still being discussed with our Bedfordshire friends. Hopefully we will be able to sort something out before the entries are all taken up! It is amazing how much this tournament has grown in the past couple of years... and also how the adult tournment seems to have reduced in size. Barely 10 adult clubs have entered so far for their event. (and is NOT on Sunday, 25th May as I erroneously wrote on the fixture list! ). Sorry for the confusion. An extra match has been added to the U15 fixture list. This Sunday (16th March) we now have a game at Hertford for the U15 girls between Hertford, Letchworth/Ampthill and Old Albanians, which will kick off at 1pm. Depending on the number of girls that each team will bring it will either be a little three way match or single game by combining the three clibs into two teams. Players will have to come ready to play as changing facilities will not be available until later in the afternoon. Hertford ladies will also be playing in the afternoon after the girls match and the players are invited to stay and watch. With just a few more training weekends left, the season is building towards the usual frenetic conclusion with a host of 10s and 7s tournaments in April and May. A year ago, when this blog celebrated its first birthday, we were slightly bowled over by it having 11,400 hits. Today, with the second year almost up, that actually seems quite unimpressive because over the past year we've just over another 25,000 hits - twice as many as last year! That's just shy of 37,000 hits in two years. And, at the moment, that means round 70-100 hits every single day. And all this for what is - by and large - a site that concentrates on the activities of one relatively small junior girls rugby team. Okay occasionally it does stray a bit, but even so. Which is very flattering - but worrying though, but the fact is that finding out what is going on can been astonishingly hard. What with the enormous media coverage the game gets (NOT!) everyone relies on the 'net, but even here there are very few outlets for information about the adult game never mind junior girls rugby. The main source (RFUW) seem to suffer from an not only an overstretched HQ staff, but also from having to use the RFU's system -which was probably was the latest thing about three-four years ago but now seems very inflexible. In the world of blogs and wikis is ever so slightly old hat (it doesn't even have an newsfeed!). In a slightly unpublicised move (well, I missed it) East Region have switched from using the RFU's official database-driven website to using a blog instead. And having wrestled with the maddening, overly complex, infuriating nightmare that is that RFU system I do not blame Phil and his team for taking that step!! Actually I came close to doing this last season - I quickly gave up with the "official" system! - but in the end thought it better and more efficient to simply work through the county blogs as that way dupilication could be avoided and readers would not have to look into two places. But things in the world of blogs have moved on and now, with the ability to incorporate newsfeeds from one blog in the design of another, this is no longer a problem. So its a big welcome East Region Blog! Granted that, in any practical sense at the moment, the number of our players actually interested in the activities of East Region can be counted on the fingers of one hand (and moreover with the majority of digits to spare!) but in the future it is possible that our representation may rise again, so its something to keep an eye on. As a result the newsfeed from the East Blog appears in the column to the left below the Herts County blog feed. As with the county feed you will see links to the latest five articles on the East Blog, automatically updated when new articles appear. The link on the left under "Official rugby websites" has also now been changed to the new site. PS: North East Region have also launched a website. Okay, we don't have anyone with any practical interest in that region at all (unless you can qualify for a region by parental birthplace!) but its still interesting to see how the game is developing elsewhere - especially in a major centre of the game like the North East. At a surprise presentation during today's practice, club chairman David Sharp presented Katie with the RFU's Young Volunteer Award - which she can been seen proudly modelling below. 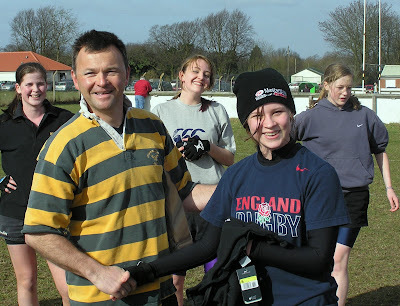 The award - which Joe also won last year - has been awarded by the RFU in recognition not only of Katie's contribution on the field and within the section, but also for her work with the girls at Highfield and with the U12 tag team last season. 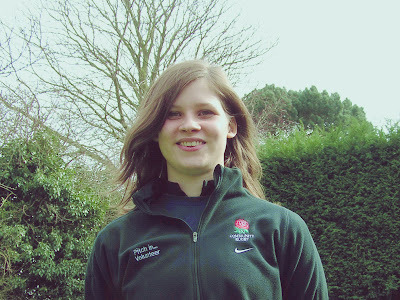 With the latter in mind it is therefore perhaps worth winding the clock back a a bit four years to the days when Katie herself was an U14 tag player, representing North Hertfordshire in the 2004 Herts Youth Games in a team that also included Hayley and Ruby. About half of the girls came from Hitchin RFC - and they promptly disappeared to who knows where after returning to Hitchin (a great pity as there were two or three VERY good players amongst them). The Letchworth contingent, on the other hand - reinforced by the odd friend and (at the time) smaller sister - came back to Legends Lane in September to form their own team. On that first day we had eight girls - with Katie forming the entire U17 team on her own - but within six weeks the squad had doubled in size, Milton Keynes were put to the sword... and the rest is history!